Woburn Sands sits on the edge of the Bucks / Beds county borders. The counties meet through the middle of the high street. Spring Grove sits on the Buckinghamshire County side of the road. Spring Grove has 10 houses within a small cul-de-sac. Ours sits halfway down on the left. We moved to number 6 Spring Grove, Woburn Sands in June 2005, a Victorian working class style house originally built approx. 1905. The house had been rented out for a number of years before we moved in. It was unloved, higgledy piggledy and falling apart. But we could see the potential and fell in love with the house. Abandoned on the floor of the hall amongst the dust, dirt and cobwebs we found a box file of old paperwork. We were amazed to find copies of all the original paperwork from all the exchanges from owner to owner dating back from 1827. That was it I was hooked on finding out more. Spring Grove was originally a right of way running from Station road down to the stream and then following the stream up to Theydon Avenue. Today Spring Grove runs up to the stream (which now runs underground). The right of way was dirt and gravel and full of huge puddles from the springs that popped up. Rain from Aspley Heath would run down a clay layer underground and pop up in and around the street . The springs were mainly seen in our location however, some did pop up in the surrounding area in Elm Grove and Blackthorn. On the left hand of the street as you walk down Spring Grove, you walk down the side of a property that sits on the Station Road, originally known as Westbury Leigh, halfway down the property a side door has been added. This is the entrance to the first home in Spring Grove. Structurally, it is within and to the rear of the main house, this encompassed the old kitchen / scullery area of the main house and the servants quarters with a skinny staircase up to the 1st floor. This was extended in 1960’s and made into a home. The second property is a detached house you come to on the left, is a beautiful old ‘L’ shape cottage – otherwise known as Rose Cottage. This is its current name, originally named Holland Cottage. The property was once a 2 up 2 down cottage and dates back to a much earlier time the earliest evidence I have seen is a land drawing from 1885. Later the extension was added to form the current ‘L’ shape in the mid 1980’s. Strangely there is no number 4, although the land space which makes up the Garage and drive for number 2 and our garden which sits to the left of my home number 6, is quite large and one could well make assumptions that this would have been a ‘plot’ originally for another home. Continuing on from number 2, you walk past an ivy clad brick wall with a wooden gate, this is the garden wall for number 6, our home. Local children in the street often referred to this as the ‘secret garden’ especially when ivy was severely overgrown and roses creeping up over the top of the wall! Note – In number 2, Holland Cottage’s original back garden, a spring popped up and is still running today under a manhole cover, in the gardens of a bungalow behind. The next house you arrive at is ours, which is one of an original pair of identical detached houses built in 1905 as 2 up 2 downs. Originally the house was named Merton Cottage. Our house had been extended extensively on the lower levels from 1978 and through the 1980’s, but upstairs had remained small in comparison. But interestingly this was only done after a land developer who owned the property between 1969 until 1977 had submitted repeated requests to build another house on the garden / land sitting to the side of number 6 up to the boundary on number 2. These requests had been refused each time. They then must have chosen to sell and the property then extended into a family home in 1977. We moved in June 2005, and have completely changed the layout and extended again further but brought the upstairs into better proportions with the lower level. Note – In number 6, Moreton Cottage’s back garden, a spring continued to pop up in the garden after heavy rainfall until the current residents, raised the ground level in 2010 following their extensions to the house. A willow tree, still stand in the garden near the spring. The current owners found under the stairs a signed piece of wood from one of the original builders. See Above – this confirms that the properties were built in 1905. The house was originally Osier Cottage and built the same as ours but again over the years has been extended in different directions. Interestingly the only rooms that both properties still have the same is the front room downstairs, the room directly behind which in both properties is a dining room and a bedroom upstairs at the front. To the right of their property they also have a piece of land that is used as their garden. At one time the gardens encompassed the land to number 10, which was sold in the mid 1970’s. Along this boundary line once stood a number of willow tree’s and the owners at the time made and sold willow baskets. The house itself remained a 2 up 2 down right up until 1998, when the current owners over time tripled the size of the property, to what you see today. Note – Outside number 8, Osier Cottage’s at the front a large spring that never dried out was evident all year in the middle of the right of way, this disappeared underground once the road was adopted in 1988. During the 1960’s half of the original gardens of the properties belonging to Number 2,6 and 8 were purchased in order to build a cul-de-sac of retirement bungalows directly behind them on the old paddocks of ‘Jackdaws’ property. These were built in the 1970’s. The next property is a small bungalow, built in the late 1970’s. It’s land was originally owned by the residents of number 8 and is one of the smallest plots on the street. Between number 10 and number 11 is a walk way through to the road behind, Elm Grove. This right of way once extended further up to Theydon Avenue which was home to the brick works. Today the section between Spring Grove and Elm Grove is paved, however, the remainder which snakes up from Elm Grove behind the backs of the garages to Theydon is still to this day dirt and gravel. This once tracked the small stream which now runs underground and pops up again at the back of the gardens to Number 9A. As for the right of waythis officially finished running into Spring Grove and down to the main road, some say it continued with the stream, but there is no legal document to support this from the land deeds that I have seen in the past 100 years. The path that once followed the stream was fenced off between the Plysu plant which once stood there and number 11. At the end of the cul-de-sac is a traditional Victorian property, sitting on a large plot of land with extensive gardens behind. This is Winthorpe, built in 1887 as a three bedroom property. This land is believed to be connected with Twelve Acres, mentioned with the right of way. At one time a small children’s nursery was run from behind the property. When you turn around and face back up the street, the next property is a new build. This property was built as a 4 bedroom property in 2012, on land sold from house Number 9 in 2011. This has already had further work done to it and is now a six bedroom property in 2016. Originally a small crab apple orchard once stood on the land as part of the garden for number 9. The next house along which has been there since the early 1960’s, built by the Dudley family. Originally named Pentewan, after where the Dudley’s spent holidays in Cornwall. Sat on a very large piece of land, of which a section was sold off with planning permission back in 2011. This is the area of land that number 9A now sits upon. It was a long shallow house which again has been extended over the years by the current owners who moved there in the mid 1980’s. The next building you come to is a large hard plastic shed this is the new electrical substation. Behind this, is a single storey brick building which was once the original electric substation. This has since been converted to an annexe / storage area for the next property, number 5. This property is a four bedroomed property built in the early 1980’s. Prior to this, the land it sits on and the land directly behind was home to a run of four terraced houses built with the fronts of their properties on West road and the backs of their properties backing onto Spring Grove. Between the last terrace house and the old electrical sub station used to be a muddy path used as a cut through between the two streets. When these properties were demolished the land in the late 1970’s it was split into two with the properties lying one on each street back to back. The old electrical substation was bought by the owners of number 5 when the current unit was established. This chalet style house was built originally in the grounds of the Nursing home that occupied the large residential lodge that sits on station road but backs onto this end of the street. It used to be the old stable block before being converted into a house and then sold off independently in the late 1960’s. Again it has been extended extensively. Within the dusty box file I found the original Abstract of Title from 1927. It is within this document I found the interesting history of whom owned the land originally and could then piece together how the street had developed. Along with copies of Indentures, and Conveyance documents and land registry documents. Neighbour’s in the street have also been very useful and have shown me land deeds back to 1885 to assist in the accuracy of this information. This was freehold land with no dwellings at this time the plot was at the back of the properties on Station road, to the side right hand side of Number 2, Holland Cottage right the way down to the stream. Running on the left hand side of the 20ft width of the Right of Way, down to the a stream at the end of the road, The land on the other side of the stream belonged to George Loke and his name can be seen on the land deeds dating back to 1885. From the Conveyance document it is clear to see that Number 2 has been sold at some stage to Mrs E Woodward whom also owns the land behind the property. William Needham still owns the land where number 8. 1950’s – Number 1 was built / converted. 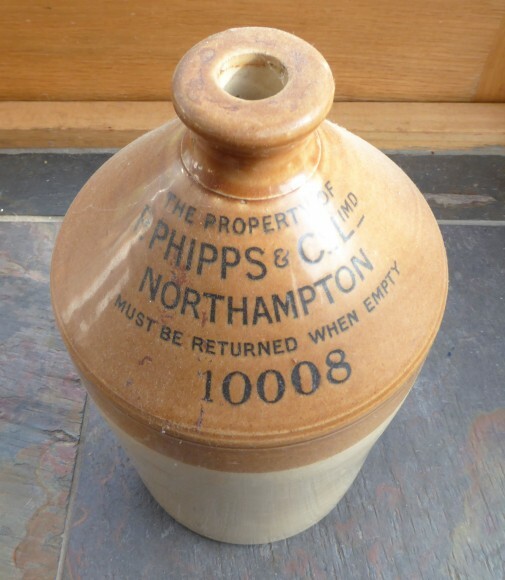 Unsurprisingly, treasures have been found over the years like the message from the builder in number 8, when we did our house extensions in 2009 we unearthed a one gallon flagon (See Below) on doing some research I discovered that both Frederick Down and William Needham were by trade dealers in wines and spirits but also agents for the P.Phipps ltd brewery in Northampton, so it was hardly a surprise that it was found on their land, however, one would question if it was one of their’s drunk personally by one of them, one returned by them or simply drank by the builders of the cottages….? My Auntie and Uncle were Bill and Vi Pursell and did indeed live at number 8. I spent most of my childhood with them from aroound 1958 when I was 3 years old, at the age of five I started at the local school but was sent home to Wolverton sometime after (not sure why), but then spent every school holiday and as many weekends as possible with them. Childhood at number 8 and the lane was to me idylic. The streams the trees pond life in the stream. I xan remember playing as a child with Cathy a young girl also at the time whp lived in the row of terraced houses the rear gardens backed onto Spring Grove, with the toilets at the bottom of the garden backimg onto Spring Grove. I can remember Janet Redford who lived at number 4? Such a quaint cottage with diamond leaded window. The house on the opposite side of stream lived the Hales Mr and Mrs Clifford Hale and their son Clifford. The Dudleys built their house opposite Auntie and Uncles and I spent an awful lot of time at the Dudleys home playing with their sons Roger, Graham and I cannot remember but I am sure there were tree. I was fasinated of how they had decorated the internal walls with a spray paint a cream colour wth green flecks. Walks in the woods primrosing and bluebelling picnics I was far too busy to have had time for an iPhone or iPad even if they had been invented. Yes I also remember PC Thurogood. Happy days fondest memories. I remember a Bill and Vi Pursell living in spring grove nor sure what number during the 80s as dad was local bobby and always popped in there for a cuppa. Bill had an amazing train set which my dad enjoyed with Bill as they were both enthusiasts. I lived in Elm Grove in the 1960s and used to walk through Spring Grove to go to Fulbrook School. Also I used to know the Dudley family well and played at number 9 regularly. I remember the home at the end. The son of the owners used to got to school with me at Aspley Heath Primary in the 1950s. Very interesting history of this road. Well done for doing the research.